Synopsis: Celeste Newhaven is a psychic - a reluctant psychic. As owner/proprietress of Newhaven's Used Books in the northern California town of Crescent Bay, she believes she has found anonymity and a peaceful place to live - a place where she can be "normal." But when she meets a young stripper named Minnie Mouse, dark visions, mystery, and a series of unsolved murders descend on Celeste with the force of a Pacific Southwester. Unable to maintain a clear conscience, while keeping her knowledge secret, Celeste faces choices that lead her to R. Joe Gottelin, the handsome Chief of Police. 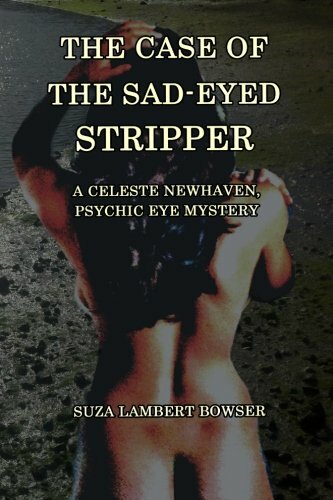 Suza Lambert Bowser introduces the first of her Celeste Newhaven, Psychic Eye Mystery series with The Case of the Sad-Eyed Stripper. Look forward to the next installment, The Case of the Red-Haired Ranchers, where Celeste navigates love, mystery, and murder in the beautiful Pacific Northwest.